Even paranoids have enemies. Hitler's most powerful foes were the Allied powers, but he also feared internal conspiracies bent on overthrowing his malevolent regime. In fact, there was a small but significant internal resistance to the Nazi regime, and it did receive help from the outside world. 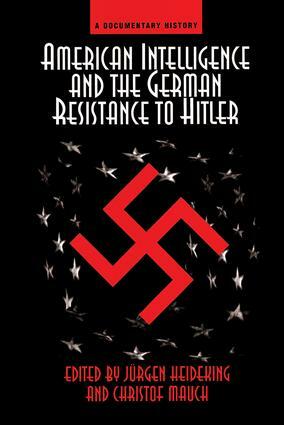 Through recently declassified intelligence documents, this book reveals for the first time the complete story of America's wartime knowledge about, encouragement of, and secret collaboration with the German resistance to Hitler?including the famous July 20th plot to assassinate the Fuehrer.The U.S. government's secret contacts with the anti-Nazi resistance were conducted by the OSS, the World War II predecessor to the CIA. Highly sensitive intelligence reports recently released by the CIA make it evident that the U.S. government had vast knowledge of what was going on inside the Third Reich. For example, a capitulation offer to the western Allies under consideration by Count von Moltke in 1943 was thoroughly discussed within the U.S. government. And Allen Dulles, who was later to become head of the CIA, was well informed about the legendary plot of July 20th. In fact, these secret reports from inside Germany provide a well-rounded picture of German society, revealing the pro- or anti-Nazi attitudes of different social groups (workers, churches, the military, etc.). The newly released documents also show that scholars in the OSS, many of them recruited from ivy-league universities, looked for anti-Nazi movements and leaders to help create a democratic Germany after the war.Such intelligence gathering was a major task of the OSS. However, OSS director ?Wild Bill? Donovan and others favored subversive operations, spreading disinformation, and issuing propaganda. Unorthodox and often dangerous schemes were developed, including bogus ?resistance newspapers,? anti-Nazi letters and postcards distributed through the German postal service, sabotage, and fake radio broadcasts from ?German generals? calling for uprisings against the regime.This is much more than a documentary collection. Explanatory footnotes supply a wealth of background information for the reader, and a comprehensive introduction puts the documents into their wider historical perspective. Arranged in chronological order, these intelligence reports provide a fascinating new perspective on the story of the German resistance to Hitler and reveal an intriguing and previously unexplored aspect of America's war with Hitler.